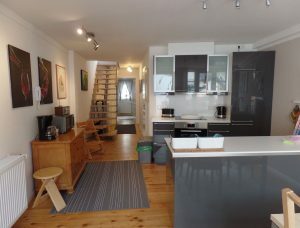 The cozy apartment (65 square meters) is located in the historic center of Ahrweiler. From the large terrace you have a superb view of the vineyards and the Red Wine Trail. You can expect a lovely furnished apartment unit with a modern, fully equipped kitchen; a charming bedroom; a bright living room and a large bathroom. The old town of Ahrweiler, with its old half-timbered houses and wineries are nearby. The apartment is very easy to reach by train (distance to 500m station) or by car. Bikes can be parked in a separate room.